Although Las Vegas in known for its lavish casinos, theme hotels and bright neon lights, it’s also surrounded by some very scenic country. Despite the fact that many people don’t venture off the strip when they visit Sin City, a day trip to the nearby desert is a perfectly doable venture. Luckily, you don’t have to wander far from the action for some great scenery, as Red Rock Canyon National Conservation Area is less than an hour away. And the good news is, it’s a good choice for wheelchair-users and slow walkers. 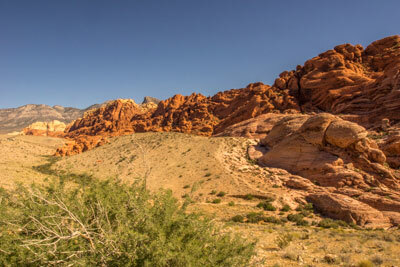 Located 17 miles west of Las Vegas on Highway 159, Red Rock Canyon National Conservation Area features over 190,000 acres filled with what naturalists describe as “the best of the Mojave Desert”. There’s no charge to visit the conservation area, but there is a $7 per vehicle fee to take the 13-mile scenic drive. On the other hand, since it’s a Bureau of Land Management site, national park access passes are accepted. The best place to start your visit is at the Visitor Center, located about four miles from the park’s eastern boundary off of Highway 159. Just take a right on the second street and follow the signs. Accessible parking is located near the building, with level access to the entrance. Inside, there’s plenty of room to navigate around the interpretive exhibits, and accessible seating in the theater. The bulk of the interpretive exhibits are located out back, with level pathways to four themed areas – Earth, air, fire and water. The Earth exhibit features an enclosure which houses Hugo, a desert tortoise, while the water exhibit stresses conservation of this precious resource. You can create your own dust devil over at the air exhibit, and learn about agave roasting pits in the fire exhibit. This area is a great example of universal design, as it was built to be accessible to everyone. There’s also a paved pathway that leads over to an accessible picnic area out front. You’ll get a great view of the red rocks from there, however it’s not covered, and the sun can get pretty intense in the afternoons. The 13-mile scenic begins just down the road from the Visitor Center. This loop drive winds past sandstone cliffs, red rock canyons and limestone outcroppings and features desert flora and fauna along the way. There are a number of stops on the route, some of which are more accessible than others. Even if you can’t get out of the car, you’ll still get some great windshield views along the loop. 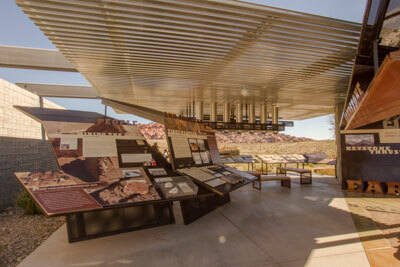 The first overlooks are Calico I and Calico II, where you can get some good views of the Calico Hills. Calico I has accessible parking, with curb-cut access out to the overlook, where you’ll find a wheelchair-height viewing scope and some benches. The walkway to the scope is hard-packed dirt, and beyond that there is a non-accessible trail that leads down into the canyon. Calico II features accessible parking near the overlook, and an accessible restroom in the parking area. The parking area is paved, and you can get a good view from there, if you can’t make it out to the overlook. Up the road at the Sandstone Quarry, there is accessible parking on asphalt, and an accessible restroom in the parking lot, There is good access out to the viewpoint, where you’ll get a nice view of the abandoned quarry. The next stop is High Point overlook, which offers a panoramic view of the area below. There’s no accessible parking at this overlook, but the parking lot is paved and there is level access over to the viewpoint. 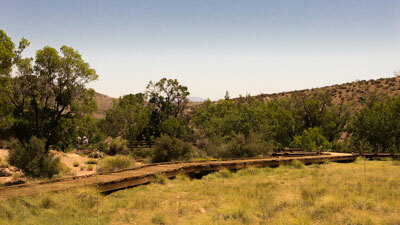 Next on the list are the Ice Box Canyon overlooks, which are located right across the road from one another. There’s accessible parking on asphalt and an accessible restroom in the parking area. This shady canyon boasts seasonal waterfalls and it’s named for the cool breezes the blow through it. There’s paved access out to the overlooks on both sides of the street, and they each offer a different perspective of the canyon. 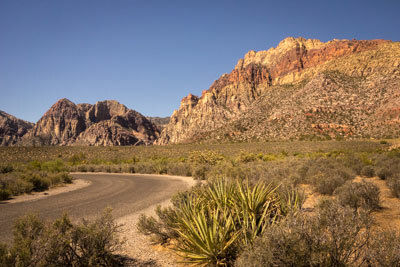 Just up the road on the left is Red Rock Wash overlook, one of the most scenic stops on the drive. There’s no accessible parking, but the lot is paved with level access out to the edge, where you’ll get a good view of the wash. After you’ve taken it all in turn around for an equally impressive view of the sedimentary red rocks on the other side of the road. This stop looks unremarkable from the road, and as a result many people just pass it up. Don’t make that mistake. Even if you don’t get out of your car, you’ll still get a great windshield view. There’s also a bench that faces the red rocks, so you can sit down and enjoy the view. Pine Creek Canyon is the last overlook on the scenic drive, and it boasts accessible parking on a gravel pad near the accessible restroom. From there, you can access the hard-packed dirt and gravel covered viewing area above Pine Creek Canyon. Again, if you don’t feel like getting out of your car, you’ll still get a decent windshield view from the parking lot. Although the scenic drive ends at Highway 159, there’s still one more viewpoint along the highway. Red Rock overlook, which is located just up the road, features accessible parking with barrier-free access to the viewpoint. From there you’ll get a good panoramic view of the whole scenic drive area. There are also accessible restrooms and some shaded picnic tables; and although the tables don’t have accessible extensions, they are located on a cement pad. And since this overlook is located outside of the fee area, you can enjoy the view for free. Although there are a few picnic tables along the scenic drive, the best place to take a lunch break is at nearby Red Spring. Located outside of the fee area, it features accessible picnic tables and a nicely done accessible boardwalk trail. It’s just east of the Visitor Center, off of Highway 159. There’s plenty of accessible parking, with a cement pathway over to the individual picnic shelters. And in the true spirit of universal design, all of the shelters have accessible picnic tables. There is also an accessible restroom in the parking lot. To get to the half-mile boardwalk, take the boardwalk trail behind the picnic area. The trail climbs gently up the hillside, and there are plenty of level spots to take a break along the way. At the top it opens up to another boardwalk that loops around the alkali meadow. 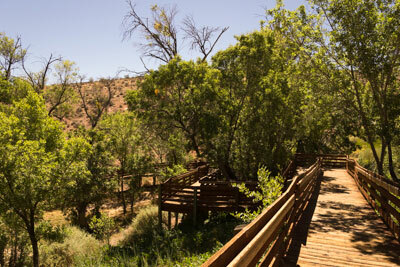 The boardwalk has a low bumper instead of a railing, so you can get unobstructed views of the Calico Basin meadow. Interpretive panels and benches are located along the way to Red Spring, which is on the far side of the meadow. And don’t miss the petroglyphs at the base of the sandstone cliffs. It’s a very pleasant walk, with lots of shady areas, scenic overlooks and interesting vegetation on the way. Sit down and enjoy the meadow for a spell, as it’s the perfect end to any Red Rock Canyon visit.